The Hundred Guilder print: Christ surrounded by numerous figures, many sick, blessing the little children. 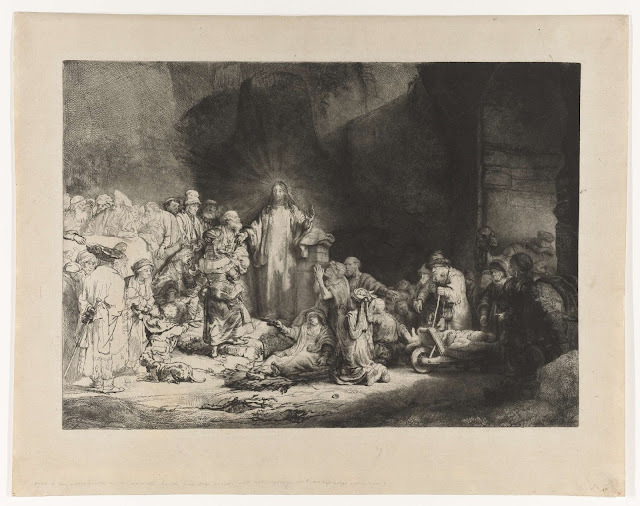 Throughout the eighteenth and much of the nineteenth century this was the most famous and popular of Rembrandt's prints. "29 And everyone who has given up houses or brothers or sisters or father or mother or children or lands for the sake of my name will receive a hundred times more, and will inherit eternal life. 30 But many who are first will be last, and the last will be first"
St. Ephrem the Syrian (c.305 - 373) is said to be the greatest Christian poet before Dante. He was admired by Saint Jerome, he was loved by Syriac-speaking Christians, and on 5 October 1920, somewhat belatedly, he was declared Doctor of the Church by Pope Benedict XV. "Ephrem, honoured by Christian tradition with the title "Harp of the Holy Spirit", remained a deacon of the Church throughout his life. It was a crucial and emblematic decision: he was a deacon, a servant, in his liturgical ministry, and more radically, in his love for Christ, whose praises he sang in an unparalleled way, and also in his love for his brethren, whom he introduced with rare skill to the knowledge of divine Revelation." and again 'the healthy do not need a doctor, only the sick'. so that the putrefaction of the wound may become more incurable? Why, beloved, do you hate yourself? Do you not wish to be freed from your secret wounds? he cures only with a word. approach him, sinner; be cured easily. who by tears and groans heals your wounds. bring him your tears, which are the best medicine. to be saved by his own tears. For nothing is too difficult to be cured by tears. nor does it acidify the wound, but cures you at once. approach him, and do not be afraid. and bring the medicine of tears and sobs. and put up with your contempt. Why do you hate your life, o miserable man? But you, a sinner, have despised it. the door of his healing to be closed. Willingly gladden the heavenly host by your repentance. for your sake it waits for you to come home.